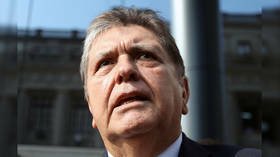 Former Peruvian President Alan Garcia has reportedly died after shooting himself in the head as police arrived at his home to arrest him. The ex-president was rushed to hospital, but doctors could not save him. As police officers knocked on his door on Wednesday morning, Garcia shut himself in his room and shot himself in the head. The former leader was rushed to hospital and suffered multiple cardiac arrests during surgery and died several hours later, Reuters reported. Published on Wed, 17 Apr 2019 14:55:42 GMT, © All rights reserved by the publisher.